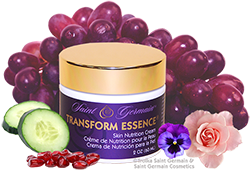 The most amazing skin cream on the planet! Too many features to list here - please Download a PDF full of info here. The Elixir is an Accelerator and also allows the physical body to hold more Light and higher frequencies. How that energy is utilized is up to the individual. 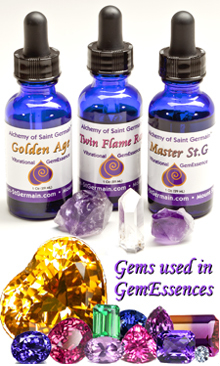 A GemEssence is an alchemical liquid that carries a vibrational frequency of the Higher Realms. They are made from complex formulas of precious gemstones, pure Mt Shasta water and brandy. GOLDEN AGE -- the Vibration of the New Golden Age; Peace. Harmony, Unity, Abundance, Beauty and LOVE! TWIN FLAME RAY -- bring forth the Divine Feminine and Divine Male energies within yourself. Doing so will bring more love, joy and happiness into your daily life, as well as, improve your relationships with friends and lovers. MASTER St. G-- bring forth the vibration, energies, and qualities of Saint Germain within yourself. Doing so will bring more freedom, transformation and magic into your daily life. Use to call forth the Violet Flame to clear and transmute negativity within yourself or in your surroundings. It is important to ASK for transmutation to take place, and then fill yourself and area with The Divine Golden Light. Use the magical, mystical energy of Alchemy to help manifest your wishes, goals and desires into this reality. Remember that True Alchemy is the transformation of the lower human self into the Divine Self. Call in the energy and vibration of Ascension during meditation. Learn to take your body, mind and spirit to that high level of consciousness and Ascend into the Higher Realms. Please do NOT use this one while driving. Use with the Greatest Respect during prayer or meditation to connect with your Beloved I AM Presence, Highest Energy within our existence, also known as God, Source, One Spirit, Creator and The All That Is. Please do NOT use this one while driving. Tap into the Magic and Wisdom of Merlin the Magician, Wizard Supreme, Guide to King Arthur and All on the Inner Planes. Use this spray anytime you desire to experience his energy, especially to learn about Magic, receive his guidance and communicate with him. This formula is $38 due to it's costly ingredients. Use to call in Quan Yin, Divine Mother of the Seventh Ray and Goddess of Compassion, to feel her Love, receive her guidance and communicate with her. Copyright © 2012-2017 DIVINE MASTER WITHIN.